HABIT: Orange-red tubes look most like firecrackers as they explode with color all summer long in flowerbeds, borders or container gardens. The species name ignea is Latin for fire. This references the brilliant orange flowers. As the flower matures, it extends a thin threadlike pistil that looks just like a fuse. It is a subshrub that grows to about 3 ft in height with a similar spread. The leaves are lance shaped or narrowly elliptical and dark green measuring 1-1.5” in length and 0.25-0.5” wide. They are arranged oppositely on the stems and flowers arise from where the leaves attach. The stems themselves are slender semi-woody, and tend to be brittle. The plant can become a little leggy late in the season but that hardly hurts its beauty. CULTURE: Pinch back the stem tips occasionally to maintain a dense compact shape. Does best in bright sun but tolerates some shade. Likes moisture but will endure short dry spells. Hardiness: USDA Zones 10 - 12. This frost tender tropical plant is also grown in Zones 8 and 9 where it may be killed back to the roots but usually returns. In other areas this fast grower is grown as an annual. Propagation: easily grown from seed. Also from short stem tip cuttings taken in late spring or early summer. USES: Use wherever you want hot bright color throughout the summer; masses to provide a backdrop for shorter plants in the perennial bed, as a compact shrub or in containers. If you garden in a frosty zone cigar plant is easily and inexpensively grown as an annual. Its fast growth rate will ensure a long flowering season. 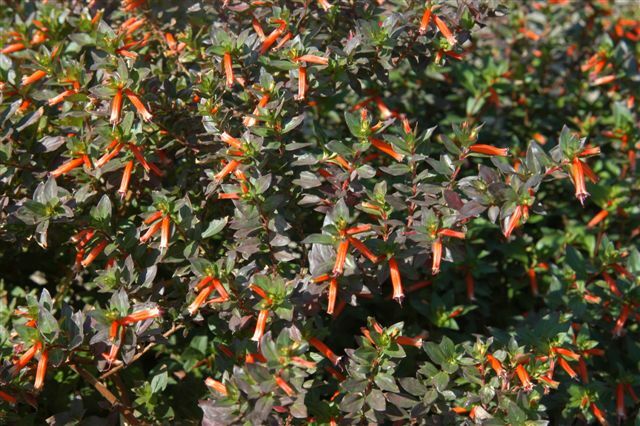 Combine cigar plant's orange with its close cousin, Mexican false heather's (Cuphea hyssopifolia) purple to create interesting combination of colors. The false heather grows a bit lower and can help hide the cigar plant's legginess late in the season. Excellent for attracting butterflies and hummingbirds. Orange and yellow blooms on 3-4 foot plants in late summer to fall. It is equally attractive to hummingbirds. NOTES: Native to Mexico and the islands of the West Indies. In recent years, no doubt due to its many talents, the cigar plant's popularity is on the rise among gardeners everywhere.